Gone are the days when sewing was associated with our grandmother's Brother sewing machine. Crafting has hit a resurgence in popularity recently, which is great for everyone. Not only is sewing a great way to relax and unwind after a long day, but it also provides you the opportunity to make specialized gifts for your loved ones. Although you can sew by hand, a sewing machine is much more practical. Not just any sewing machine will do, though. You have to buy a great one, which means you need a Brother sewing machine, too. Why Purchase a Brother Sewing Machine? 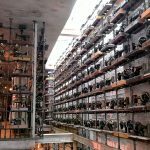 If you are new to sewing (or haven't owned a sewing machine in over ten years), you'll be fascinated at what modern sewing machines can do. First of all, the majority of contemporary sewing machines now have LCDs. That makes it much easier to select the stitches you want to use as well as adjusting your stitch width and length. Some sewing machines even can embroider as well. Many of these machines allow you to connect to your computer so that you can make your own embroidery designs for the perfect customized gift. If all of those options sound like a bit too much for you, there is no need to worry. Brother also has some fantastic simple sewing machines available that simple to use, but still very helpful when it comes to sewing projects. 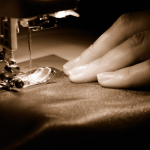 The sewing machines we reviewed for this article can help with a wide range of projects. There are sewing machines for quilters, embroiderers, people who sew for an income, and people who sew as a hobby. Regardless of what you need a sewing machine for, chances are you'll find a perfect one on our list. One of the great things about a Brother sewing machine is they are all affordable. The most expensive sewing machine on our list is almost $300, and the least costly sewing machine is about $75. Like with most purchases you make, the more you spend, the more you'll get. The basic brother sewing machine is similar to older styles. It has ten built-in stitches, which will allow you to sew most projects such as stuffed animals, clothing, draperies, and quilts. The most expensive brother sewing machine on our list can do anything you would ever need a sewing machine to do. It has 67 built-in stitches, five lettering fonts, and over 50 integrated embroidery designs. Even for the part-time crafter, this machine is a great deal. It will allow you to save money on any kind of customization such as sports uniforms, work uniforms, backpacks, etc. Gift giving will be a new joy when you can make custom presents for all the loved ones in your life. Brother has been in business for 110 years. In May of 2017, they manufactured their 60 millionth home sewing machine. When a company has been around for such a long time, they are usually pretty good at what they do. Brother stands behind all their sewing machines with a 25-year limited warranty. Here are our top 10 choices (in no particular order) that you should consider for your new Brother sewing machine. The Brother CS6000i sewing machine offers a wide range of options for both quilting and sewing projects. There is room in the arm of the sewing machine for you to store accessories, so you never have to worry about losing those little bits and bobs. The LCD allows you to adjust your stitch length and width as well as select one of the 60 different stitches. Although it comes with a foot pedal, there is a start/stop button which allows you to use the sewing machine without this. There is also a speed control which allows you to adjust the speed of the machine to a level that is comfortable for you. It also has a quick-set drop bobbin. That means that you don't have to go fishing for your thread ever again. It received 4.5 out of 5 stars on Amazon. There were many reviews from beginners who loved how easy it is to use the machine; there were some complaints about the seams coming undone though. This model is the special Project Runway model. It has 50 stitches to choose from which you can use for creating your clothing as well as quilting. This model also has six specialty feet and specialty needles that can be used for a variety of projects and comes with an arm for sewing sleeves and cuffs. There are five buttonhole settings which automatically size holes to fit specific size buttons. It has easy threading options for the thread and bobbin. 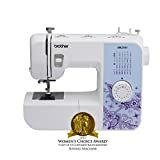 This brother sewing machine has 4.3 out of 5 stars on Amazon. People rave about the accurate stitches and how easy it is to dial in. There are some complaints about the tension on the sewing machine when making things like blankets. The Brother SE400 is the most expensive sewing machine on our list, and it is worth every penny. You can quilt, embroider, and sew with this machine. It has a touchscreen LCD screen which allows you to select from the 67 sewing stitches, five fonts, and 70 built-in embroidery designs. If you can't find an embroidery design you like from the built-in ones, no need to fear! This brother sewing machine has a computer connectivity function. This means that you can hook your sewing machine up to your computer and download embroidery designs from a variety of sites online, some of which allow you to make your own custom designs as well. It received 4.4 out of 5 stars on Amazon. Both experts and beginners love this machine and all the options it provides. There are some reviews from people who have problems with the needle becoming misaligned. This Brother sewing machine has 62 stitch functions and 27 built-in stitches including blind hem, decorative, zigzag, and stretch stitches. It also has a one-step auto-size buttonholer which will work for almost all buttons. The six quick change sewing feet allow you to quickly sew zippers, buttonholes, blind stitches, a narrow hem and more. The built-in needle threader and jam-resistant bobbin make this machine easy to use for anyone who is a little technically challenged. It received 4.5 out of 5 stars on Amazon. Customers say this is a great machine for beginners, although there were some complaints about the foot pedal speed. The XR3774 Brother sewing machine is lightweight and has a beautiful light blue and flower design. It is perfect for newbies and advanced crafters. This sewing machine has 37 built-in stitches, including decorative, blind hem, and quilting. The extra wide table is ideal for large projects like quilts and blankets. If sewing clothes are more your style you'll be happy to know that it also comes with a free arm that you can use for sewing sleeves, cuffs, and pant legs. It also includes an instructional DVD that shows how to do everything from threading the sewing machine to sewing on buttonholes. 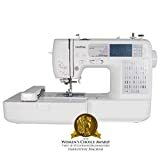 This sewing machine received 4.4 out of 5 stars on Amazon. People love how easy it is to thread and learn to use, but it does seem to have problems with skipping stitches occasionally. This Brother sewing machine has some great features. It is perfect for quilting, sewing, and monogramming. It has 130 built-in stitches and eight different styles of buttonholes. There are also 55 stitches specifically for monogramming. It has a built-in stitch reference flip chart so you won't have to worry about finding the guide anytime you have a question about the different stitches. The quilting features allow you to add an extra wide table (which comes with the sewing machine) and also allows for free motion quilting. The detachable foot controller and adjustable sewing speed give you plenty of options for how to operate the machine in a way that is most comfortable for you. It has 4.5 out of 5 stars on Amazon. People love the cost of this machine in relation to all the features it comes with. Some of the machines do seem to experience problems with the foot pedal. The CX155LA Brother sewing machine is their special Laura Ashley limited edition machine. It has 155 built-in stitches, eight one-step auto-size buttonhole options, and one font. 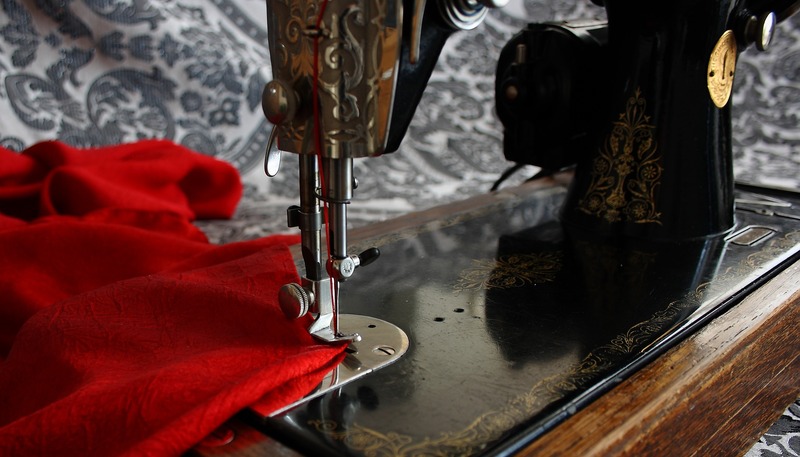 This sewing machine is great for people who feel inspired to make their own home decor. The wide range of stitches are perfect for curtains and throw pillows. The blind hem stitch makes practically invisible hems on curtains and blankets. The jam resistant quick set drop-in top bobbin and advanced needle threading system means you don't have to struggle just to get the sewing machine set up. This model has 4.4 out of 5 stars on Amazon. Customers like the variety of stitches that come programmed in this model. There were reported issues with the needle threader. This Brother sewing machine is the most affordable on our list. This is a pretty basic sewing machine but is perfect for a beginner or part-time sewing enthusiast. It has ten built-in stitches including stretch stitches, zigzag and blind hem. The four auto-size buttonholes mean that you can easily make projects that use the most common sized buttons available. This model comes with an easy to use stitch selector dial, automatic bobbin winder, and a jam-resistant drop-in top bobbin. It has 4.1 out of 5 stars on Amazon. People who purchased this machine say that it is sturdy and robust, but encourage beginners to watch the instructional DVD that is included with it. The ST371HD Brother is advertised as a heavy duty sewing machine, and it certainly looks like one. 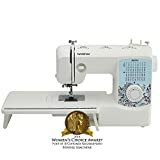 While this model resembles older sewing machines and is lacking in some of the prettiness of other models on this list, it has some great features. There are 37 stitches programmed into this sewing machine, for both decorative sewing and utility sewing. That means that on top of your standard projects you can also make items from jeans, canvas, burlap, leather, and suede. Additionally, it comes with a #14 needle for sewing layers of fabric, a #16 needle for heavyweight fabrics, and #11 needle for everyday sewing of lightweight materials. This model also has six different feet included. The nonstick foot is excellent when working with fabrics like vinyl, leather, and suede. 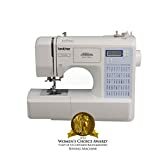 This sewing machine has 3.9 out of 5 stars on Amazon. This machine received rave reviews for its ability to sew thicker materials. Some people were unhappy that the machine is made out of plastic. This Brother sewing machine is marketed towards people who have some experience with sewing. It has 185 built-in stitches including 55 alphanumeric stitches. The advanced needle threading system means all you have to do is press a lever on the side of the sewing machine and your thread will be pushed through the eye of the needle. The extra wide table is perfect for quilts, clothing, and draperies. The LCD makes selecting your settings a breeze. The eight automatic buttonhole styles mean that you'll be able to create projects using virtually any kind of buttons with ease. It received 4.3 out of 5 stars on Amazon. Customers love how easy it is to set up. Although some people did have issues with the automatic threader not working correctly, most people love the sewing machine. Which Brother Sewing Machine Is The Best Choice? Honestly, this all depends on what kind of projects you'll be using your sewing machine to make. If you are a casual crafter who wants to make some doll clothes, pillows or simple blankets that the XM2701 model would be perfect for you. 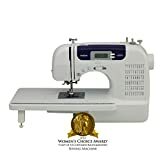 If you are a professional seamstress who spends hours a day sewing, then you should look into one of the more expensive models. They can provide you with the kind of options you might be looking for. Regardless of which Brother sewing machine you choose, you can rest assured knowing that you are buying from a long-lasting company who has a fantastic warranty and great customer service.